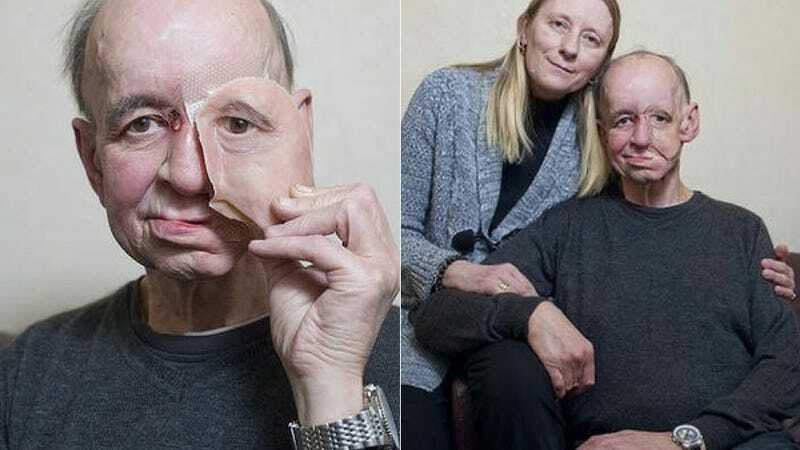 While doctors have experimented with 3D-printed prosthetics in the past, none has been quite as prominent or incredibly detailed as Eric Moger's newest addition: a prosthetic, 3D-printed face. Four years ago, Eric underwent surgery to remove a tennis-ball-sized tumor in the left side of his face—along with almost the entire face itself. Left with what was essentially a gaping hole where one should not be, he's been forced to eat and drink through tubes going directly into his stomach ever since. You'll see why if you click the picture here, although be forewarned: this is probably not for the faint of heart. But in what is believed to be one of the first procedures of its kind, doctors used CT and facial scans of the remainder of his skull to recreate what it should look like in the form of a digital blueprint. The same digital blueprints one might use in 3D printing, for instance. Then using nylon plastic, the doctors were able to print off a perfectly fitted, incredibly lifelike facial prosthetic. Even the actual screws holding the piece in place were products of this revolutionary technology.